Fluffernutter Candy is based on the classic fluffernutter sandwich, made with peanut butter and marshmallow fluff. 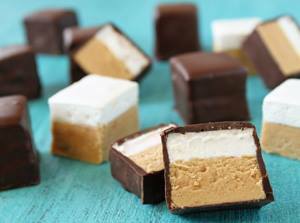 In the candy version, there is a base of peanut butter fudge, topped with vanilla marshmallows. The candies can be enjoyed plain, but they tend to stick together, so I like to dip them in tempered chocolate, because everything is better with chocolate!